The U.S. military has successfully demonstrated what it says is the first ever in-flight refueling of an unmanned aircraft, and in doing so completed a flight test program that leads to a new generation of military drones due to take flight in the 2020s. The refueling was conducted on April 22 in the Atlantic Test Range, off the coast of Maryland and Virginia. There, an X-47B autonomous aircraft automatically maneuvered itself to mate with the refueling probe trailing a K-707 tanker aircraft and receive over 4,000 pounds of fuel, the U.S. Navy said. The X-47B is an experimental drone built by Northrop Grumman as part of the Navy’s Unmanned Combat Air System demonstration program and it has been flying since 2011. During its testing, it has performed others firsts such as a catapult launch from an aircraft carrier and a landing. 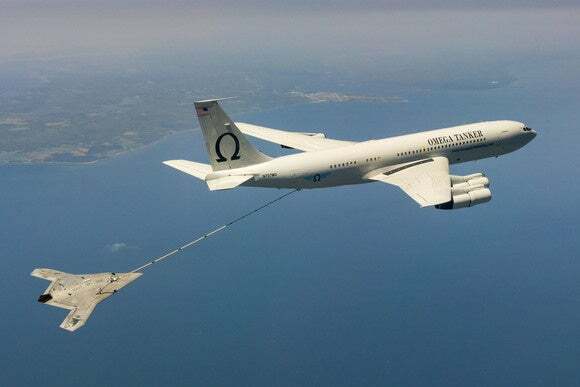 Inflight refueling allows aircraft, both manned and unmanned, to considerably extend how long they can stay in the sky. The X-47B has a range of 2,000 nautical miles, but that is on the low side compared to production drones in use by the U.S. military. The RQ-4 Global Hawk, also built by Northrop Grumman, has a range of over 8,000 miles.